Frederick Miller (1808–62) was born in London and was ordained in the Congregational church. In response to Henry Hopkins' request for a minister in Hobart, Miller and his family arrived in 1830. For 25 years Miller was secretary of the Bible Society, worked with the Sunday School Union and the Tract Society, established the Bethel Union and was an originator of the Colonial Missions Society, while also ministering to the Brisbane Street Chapel, built in 1832. 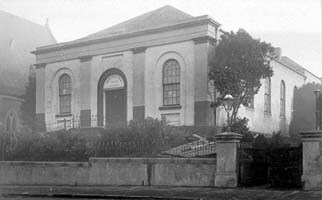 The Memorial Church in Hobart was erected in 1872 as a memorial to the foundation of Congregationalism in Australia and to perpetuate the memory of Miller, the first minister. Although ten of his eleven children went to the mainland, he has numerous descendants in Tasmania, who have included bankers, clerks, housewives, nurses, teachers and missionaries. Further reading: F Miller, Life of the Rev. Fredk. Miller, Hobart, 1930.